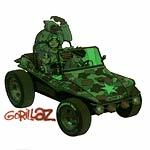 A project masterminded by Dan the Automator, Damon Albarn (Blur) and artist Jamie Hewlitt. A mix of hip hop and rock danceability (even reggae! ), which makes perfect for any house party. Friends Del (Hieroglyphics), Mito Hatori (Cibo Mato) and even Cal Tjader (Buena Vista Social Club) even drop by to drop some guest vocals.